Havelock Island is a gem of tourist destination. It hosts some of the best beaches of the world. It is a natural paradise on earth. 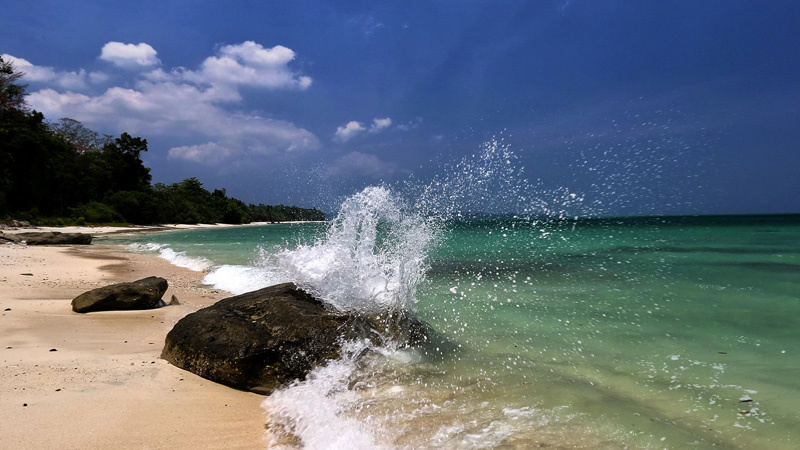 Located at approximately 39 kilometres from Port Blair and having a good connectivity, it is one of the chief destinations for the vacationers and travellers. After Radhanagar Beach and Elephant Beach which top the charts of popularity in Havelock, comes in line the Kalapatthar Beach. This Beach has probably derived its name from the local village that is situated not very far away from this beach. Or maybe it is named because of its volcanic origins. Also it might have been named Kala Patthar because of the black rocks that are strewn across the beachside irregularly. This beach is fringed by the beautiful blue seas on one side and the lush green tropical forests on the other side. The smooth silvery sands and the peace and solitude that prevail on the beach makes it a honeymooner’s delight too. A look at this beach and you will know that man respects nature and sometimes leaves it naturally beautiful without being an oppressive intruder. The beach shows no real sign of human interference and exudes a natural rustic charm. The entry point to the beach after a refreshing drive through the jungles might be a bit crowded. Walk down a bit to the right or left from the entry point and you will get clutter-free zones that are calm and peaceful without much tourist activity. It is an ideal beach to enjoy the beauty of seas in isolation. Some stretches of the roads that lead to the Kala Patthar Beach are undulating and the road runs almost parallel to the shoreline and is fringed by palm and date plantations. View the beautiful natural corals heaped along the beach line giving the beach an infusion of colours and beauty. A little distance away from the beach Beyond Kala Pathar Village lie the picturesque part of the Havelock Island with low rising hills, beautifully stretched paddy fields and banana plantations. It presents a picture of a warm quiet island life different from the tourist-infested bustling joyful noisy hubs.